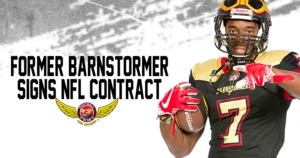 DES MOINES – Former Barnstormers wide receiver Marcus Peterson has signed a contract with the Los Angeles Chargers, the Iowa Barnstormers announced today. Marcus Peterson signed with the Chargers on Thursday, August 2, entering the team’s official training camp. Peterson (5-11, 188, Seton Hill University) signed with the Iowa Barnstormers for his rookie season with the Indoor Football League (IFL) in January of 2018 before leaving at the end of March for his shot in the Spring League showcase. Upon signing with the Barnstormers, Peterson noted that his goal was to make it to the next level and had his sights set on making a roster. Collegiately, Peterson spent four years at Seton Hill University as a receiver as well as on special teams. After his collegiate career, Peterson spent time with the Derby Braves in a European Football League where he contributed to both the offense and the defense playing as wide receiver and defensive back. Peterson joins the ranks of other former Barnstormers who launched themselves onto an NFL roster including wide receiver Marcus “Soup” Harris (New York Giants, 2013-2015); wide receiver Chris Matthews (Seattle Seahawks 2014-2015), (Baltimore Ravens, 2015-2017), and linebacker Bryan Peters (Minnesota Vikings 2015), (Houston Texans, 2015-current).